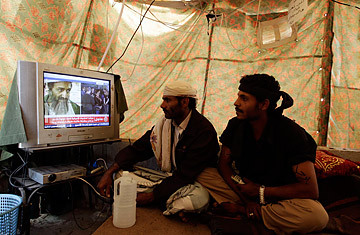 Massive crowds were gathered in Yemen's capital, Sana'a, when word broke that Osama bin Laden had been killed by U.S. forces in Pakistan. But the al-Qaeda leader's fate was not the issue that had brought thousands into the streets of his ancestral homeland. "We're not interested in Osama bin Laden," said Ibrahim al-Qahlani, an opposition protester at Sana'a's Change Square. "This is just one man, with little connection to our country. Our fight is against Ali Abdullah Saleh." Indeed, reactions to the al-Qaeda leader's death have been muted if not ambivalent in Yemen, where antigovernment protests have held the country in political deadlock for more than three months. While the Yemeni government officially labeled bin Laden's elimination a "monumental milestone in the ongoing war on terror," responses on the street have been much more subdued. "Bin Laden scarred the reputation of Islam and of our country  in this respect, his death is good news," said Abdel Malik al-Naman, a Sana'a resident. As a longtime haven for al-Qaeda activity, Yemen is a focal point of U.S. counterterrorism efforts. The country is home to the movement's most active franchise, al-Qaeda in the Arabian Peninsula (AQAP), which has demonstrated abilities to wage attacks on U.S. soil in recent years. While some fear that retaliatory attacks are likely in Yemen, analysts say that bin Laden's death won't produce significant effects in the country. AQAP operates separately from al-Qaeda's central command in Afghanistan and Pakistan. With little interaction between cells, the death of Osama bin Laden is unlikely to affect operational capabilities in Yemen, analysts say. "The local al-Qaeda franchise is more influenced by factions of the regime than it is by association with Osama bin Laden and al-Qaeda leadership in Afghanistan and Pakistan," says Abdul Ghani al-Iryani, a Sana'a-based political analyst. And that's precisely what demonstrators in the capital are afraid of. Protesters calling for the resignation of the 32-year President say that bin Laden's death could be a lifeline for the Saleh regime. In what many saw as a characteristic reversal for Yemen's mercurial leader, Saleh on Saturday refused to sign an agreement brokered by his Gulf Arab neighbors under which he would leave office in 30 days in exchange for a guarantee of immunity from prosecution  despite having publicly embraced the deal just days earlier. The initiative, sponsored by the Gulf Cooperation Council and endorsed by the U.S. and European Union, was the culmination of months of negotiations between Yemen's government, its domestic opponents, and the international community. Many saw it as the country's last chance to achieve a peaceful transfer of power. As international pressure has mounted against Saleh, a longtime ally in Western counterterrorism efforts, the President has consistently claimed that his departure would embolden al-Qaeda. Saleh has even recently sought to link the terrorist group with antiregime demonstrations throughout the country. "Al-Qaeda are moving inside the [protest] camps and this is very dangerous," Saleh told the BBC last week. "Why is the West not looking at this destructive work and its dangerous implications for the future?" Now, Saleh may hope to use the threat of new terror attacks in retaliation for bin Laden's killing to persuade the international community that he needs to remain in power. "Saleh has always exaggerated the role of al-Qaeda in Yemen," said al-Qahlani. "Why wouldn't he do the same now?" Long before bin Laden was killed, Saleh had hoped that prolonging the political crisis would strengthen his position. "The longer this goes on, the better it is for President Saleh," says Gregory Johnsen, a Yemen expert at Princeton University. "The one thing he has that people want him to give up is the presidency, and once he does that, he doesn't have any bargaining position. Arab leaders have watched what has happened in Tunisia, Egypt, Libya and Syria, and the road that most of them seem to be going down right now is that more violence and hanging on to power is better." After all, Mubarak stepped down peacefully, only to be thrown in jail.